Chicken Pot Pie – Don’t Fear the Flame – Just One Bite, Please? Well, it’s all about caramelization. Don’t fear the flame! this is how we develop deeper flavors from our food. Most recipes for Chicken Pot Pie have you boiling or oven roasting the chicken. With boiling you’ll get a rich stock that can bump up the chicken flavor, if you reduce the stock. This takes a lot of time to do. With roasting you will have a rich fond to extract from the bottom of the roasting pan, but you’ll have to pour off the fat and deglaze the roasting pan. Both of these processes involve multiple pots and pans. The process I like is all done in one large saute pan and large mixing bowl. Starting with deeply caramelizing the vegetables in butter over high heat then moving them to the mixing bowl. Next, I sear and caramelize the chicken breast in the same saute pan on medium high heat with butter, until just about cook through. The fond in the saute pan has developed now. The chicken breast then goes into the mixing bowl to rest while preparing the roux. In the same saute pan I add butter and all-purpose flour and cook the mixture over medium heat until the roux has taken on a rich golden brown color. I add the chicken stock and stirring and scraping the bottom of the saute pan to release the fond. The fond in turns melts into the sauce giving up its intense flavor and deeper color. While the sauce is simmering and thickening, I hand pull the chicken into large pieces. Combing the thicken chicken sauce to the mixing bowl of pulled chicken, vegetables, and adding frozen peas to cool down the filling to room temperature so I can fill and bake the pot pies right away. 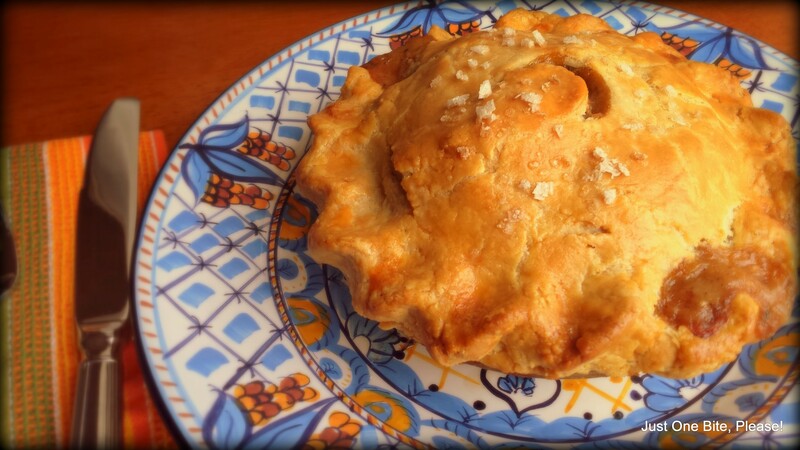 The recipe will make 1-large 9″ pot pie or 3 – 4″ individual pot pies. For the pie dough recipe check out my post: The Proof is in the Crust. Feel free to use the lard/butter or all butter for the pot pie. They are both equally delicious. 1/2 tsp. Thyme (fresh, chopped fine) Note: If using dried herbs use 1/4 tsp. 1/2 tsp. Sage (fresh, chopped fine) Note: If using dried herbs use 1/4 tsp. In the saute pan over high heat, melt the 1/4 cup of butter and heat until the sizzling stops (this is the water evaporating from the butter). Add the onions, carrots, and celery and saute until the vegetables are well caramelized. This will take 10 to 14 minutes. Add the potato, garlic, thyme, sage, sea salt, and black pepper and reduce the heat to medium, stir and saute for 3 minutes. Cover the saute pan with the lid and cook for 5 minutes covered. Remove the cover from the saute pan and place the vegetable mixture into the mixing bowl. Place the saute pan over medium high heat and melt the 2 Tbsp. of butter until the sizzling stops. Placed the seasoned chicken breast into the sauté pan. The sound of searing should be present. If not adjust the heat higher. This is how we get good caramelization on the chicken breast and develop the fond in the bottom of the saute pan. Sear for 5 to 6 minutes on the first side. Checking for color before turning. Turn the chicken breast over and sear the second side for 5 to 6 minutes. Add another 1 Tbsp of butter if need to brown and caramelize the second side. Remove the chicken breast from the saute pan and place in the mixing bowl with the vegetables to rest and cool at least 15 minutes before hand pulling the chicken pieces. While the chicken is resting. Place the saute pan over medium heat and melt the 1/2 cup butter. Add the all-purpose flour and stir and brown the roux until golden brown. Add the chicken stock and stir to combine the roux, scraping the bottom of the pan with a wooden spoon to release the fond into the sauce. Bring to a full boil and then reduce the heat to a light boil. Reduce and thicken the sauce for 10 minutes. Remove the sauce from the heat and let cool while pulling the chicken pieces. Pull the rested chicken breast into large bite size pieces. Add the pulled chicken pieces to the sautéed vegetables in the bowl. Don’t worry if the center of the chicken breast is slightly underdone. Pour the sauce over the chicken/vegetable mixture and stir together. Add the frozen peas and stir once more to incorporate the ingredients. Set aside to cool while rolling the pie dough. Roll the prepared pie dough for either 1 – 9″ pie pan or 3 – 4″ pie pans as instructed in the Pie Dough Recipe. Rolling the dough 1/2″ larger that the pie pan. Line the pie pan with 1 piece of rolled dough. Cut a “C” shape into the center of the top crust using a 1″ round cutter. Place the filling into the pie dough that is lining the pie pan. 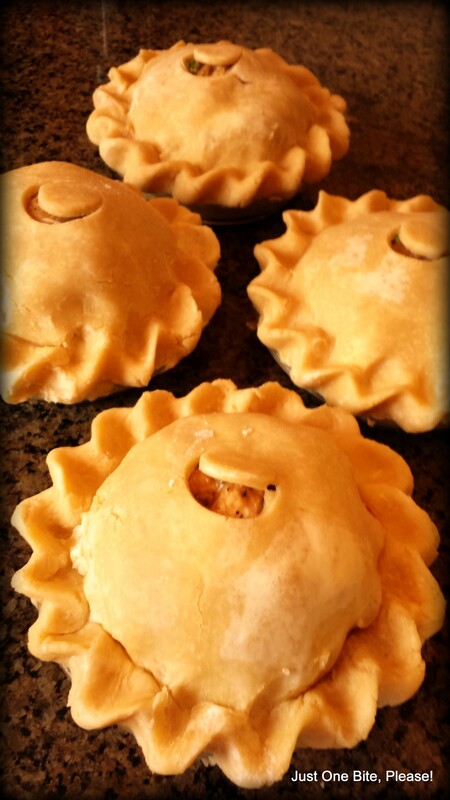 For the 4″ pot pies divide the filling evenly into 1/3 portions. Brush the edge of the pie dough with a light coat of egg wash.
Place the top crust onto the pot pie and press the top and bottom crust edges together with your fingers. Fold the pressed edge of dough underneath like a hem. Finish the edge of dough with your fingers or a fork to seal the pot pie. Egg wash the top and edges of the Pot Pie. Place the Pot Pie(s) onto the parchment lined 1/2 sheet tray. Bake at 400°F for 50 to 60 minutes, or until the pie crust is golden brown. Turning the Pot Pie(s) after 40 minutes if necessary to get even browning. Remove the Pot Pie(s) from the oven and let cool 15 minutes before serving. I would eat this very strategically…pick the top crust off first, eat the middle filling than the bottom crust! Man, this looks soooo good! Ohhhhh….that crust! That’s actually how I eat it! That’s so funny.